There has been much publicity about the policing of the G20 protests in London following the death of a paper seller who wasn't even part of the demonstration. There have been a couple of further high profile complaints and a number of others, one of which from my son. He was helping a woman who had fallen when a policeman who did not have numbers displayed on his shoulders hit him across the face with his baton. He has lodged a complaint. 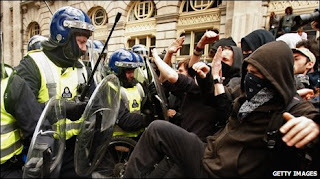 More generally a petition has been set up to oppose the use of the tactics of 'kettling', (the corralling of everyone into a confined area from which no-one can exit, often for hours at a time) batons and other aggressive police tactics at entirely peaceful protests. That's awful. Is your son OK? Yes thanks, but he got a nasty cut over his eye.